Get your 2018 Oscar buzz-senses ready: First Man, the Neil Armstrong biopic from Damien Chazelle, has just confirmed an awards-season-friendly release date on Oct. 12, 2018. 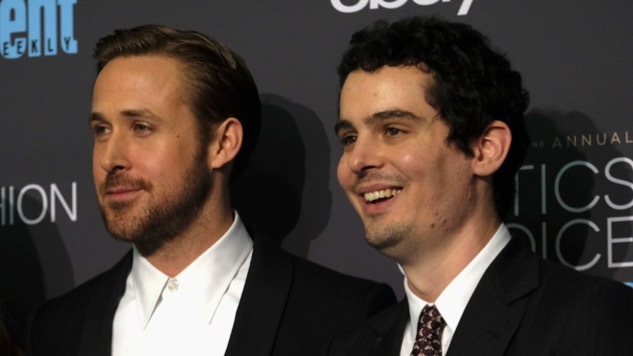 First Man will star Chazelle-muse Ryan Gosling as Neil Armstrong, following up their best-bud pact after the hugely successful La La Land. First Man is based on First Man: The Life of Neil A. Armstrong by James R. Hansen, a “visceral, first-person account” of the stakes NASA put on the first men on the moon. Following one of the most dangerous expeditions of the Space Exploration Age, it will showcase the personal and national sacrifices it took to accomplish such a feat. The film will take place in the years 1961-1969, documenting Armstrong’s life in a first-person account. Written by Oscar-winner scribe Josh Singer of Spotlight fame, this flick will surely stomp out a lot of competition, until it experiences a quick and deadly betrayal via envelope at the 91st Academy Awards in a few years. Yikes, can we hold out that long? First Man will be landing (sorry … ) in theaters on Oct. 12, 2018.